Cornwall is a wonderful place for the arts; from music and literature to arts and crafts there is something on nearly every day offering a glimpse into the creative world. The theatre is very popular in Cornwall, offering a wide range of performances for every taste from the traditional in many of our theatres across the country to the weird and wonderful with performances in woods, upon boats and in the streets. Theatre is intertwined into festivals, landmarks, and Cornish history. Tales of the deep sea are re-enacted, stories of fairies and folk are told around enchanted trees and songs are sung of the fishermen across the land. The wonderfully quirky and talented Rogue Theatre who are reknown for their tales from the woods in Idless Woods have moved to The Lost Gardens of Heligan for the summer season to put on The Lost Gardens Summer Ball, where the flora and fauna awake to an unexpected world. A must see immersive experience through these wonderful gardens. 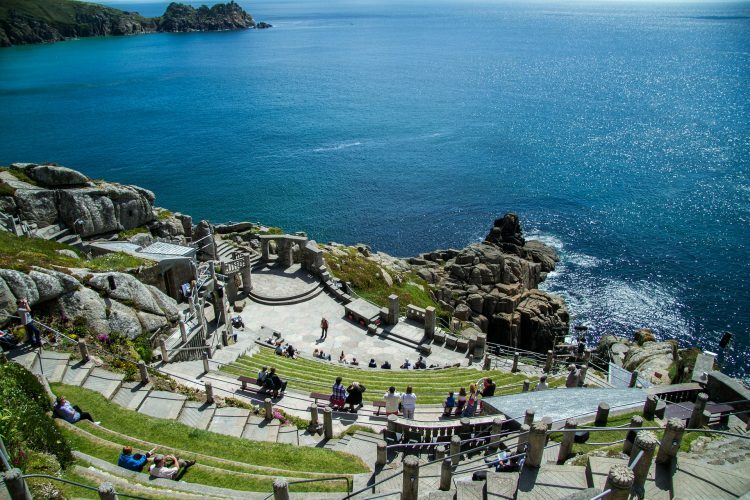 A unique amphitheatre carved from the cliff face with a breathtaking seascape backdrop makes The Minack a memorable experience before the acting even starts. The programme for the summer offers a wide range of theatre from opera, children’s performances and tales of the sea to wartime love stories, Shakespeare and the Last Night of The Proms. This festival is fast becoming one of the South West’s most popular family events. Set in the spectacular grounds of Port Elliot this festival offers a range of exhibitions, music, theatre to name a few. This entry was posted in Cornwall, Seasons, things to do. Bookmark the permalink.